There are many different types of dads. 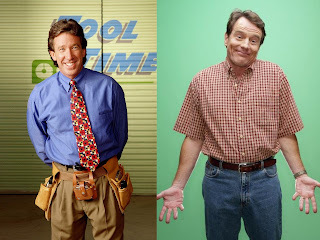 One type of dad might endure the constant bruising of his ego by pitting his flailing masculinity against ill-advised home repair projects, all while he struggles to relate to his strong-willed wife and three rambunctious sons. Another type of dad might endure the constant bruising of his ego by pitting his flailing masculinity against various Sisyphean attempts to raise a family with dignity, all while he struggles to relate to his strong-willed wife and three rambunctious sons. Just in time for Father's Day, we spend some time with two of our favorite sitcom dads - Tim Taylor of Home Improvement and Hal Wilkerson of Malcolm in the Middle - as we recount their lessons about life, love, failure, and how to act like you know what you're doing. I really loved reading your blog. It was very well authored easy to undertand. Unlike additional blogs I have read which are really not tht good. I also found your posts very interesting. In fact after reading, I had to go show it to my friend and he ejoyed it as well!